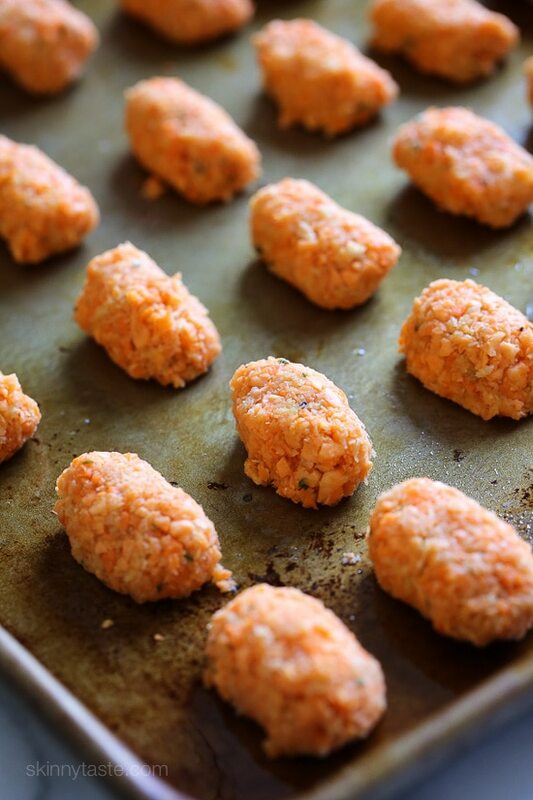 These sweet potato & carrot “tots” are a healthier alternative to tater tots, and a great way to sneak orange-colored vegetables into your kids meals which are high in vitamin C and beta-carotene. An easy sweet potato recipe your kids will love! I tested these a few times and finally got them just right. I found sauteing the vegetables a few minutes before forming them into tots made them easier to work with, and I think also improved the texture. These taste great on their own, but if your kids like to dip their potatoes in ketchup, it’s also great on the side. Preheat oven to 375 degrees and lightly spray a sheet pan with olive oil. Set aside. Cut sweet potato and carrot into 3 or 4 large chunks. 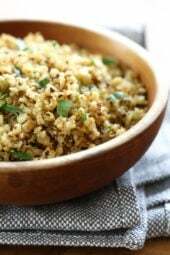 Place them in a food processor fitted with a metal blade and process until finely chopped into rice-size pieces. 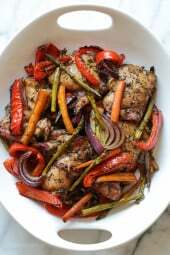 Heat a large skillet over medium heat, spray the pan with oil and add the chopped vegetables. Cook, stirring for 5 minutes, until softened. Transfer to a large bowl with the egg, panko, mozzarella, onion powder, garlic powder, smoked paprika, salt and pepper and stir with a spatula to ensure it is evenly combined. With your hands, gently form sweet potato-carrot mixture into small rectangular pieces, pressing and rolling them firmly together about 1 tablespoon each. Evenly space them on prepared sheet pan, spray with olive oil and bake for 10 minutes. Remove from oven, using your hands or small spatula, flip each over, put them back in the oven and bake for 10-12 more minutes, or until brown and crisp. Makes 30 tots. Delicious! I made these into disks instead of logs because that was easier to shape. I also grated the veggies instead of food processing and then I used kitchen sheers and cut through the bowl several times so there weren’t any long stringy bits. They taste amazing! Definitely making again. They did require about 16 minutes after the first flip to get nice and crispy. Another ask about preparing these in the air fryer. TIA! Can you air fry these? I’m super calorie conscious and would love to have these, but 20 calories is so high for just one! I was wondering if there are components I could leave out or switch – like using just egg whites instead of a whole egg, or leaving out the cheese (lactose intolerant here)? How big of a different would either of those have on the recipe? Has anyone tried this with regular potatoes to make cheesy tator tots? 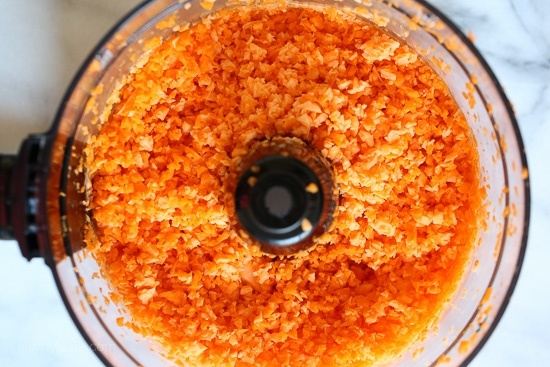 I never know what to do with my shredded carrots after making a carrot juice in my slow juicer. This is the perfect dinner ! The only thing i changed was that i put small holes with a fork into my sweet potato, wrapped it in aluminium and let it bake in the oven for 40min. After that u simply peel of the skin and mush it. I’m definitelly gonna do this recipe again and again ! Thank you !!! PS. 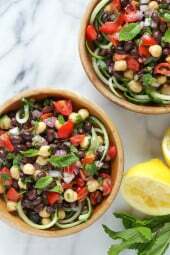 : which dips/ sauces do you recommend to it? i tried a cheesy tzaziki and it was great 😀 ! 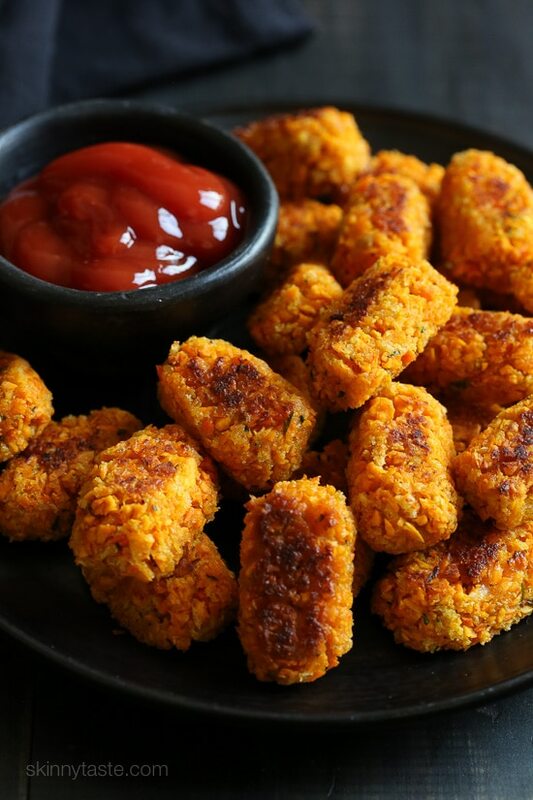 Gina – is there any way to make these and the veggie tots gluten free? I think gluten-free crumbs would be ok. I used gluten free crunbs and it works perfectly :d ! WOW!!! These were amazing. So glad I had a sweet potato and carrot to put these together. The spices worked well. Although we had them for supper with grilled burgers, they would work well as appetizers also. Thanks for a delicious new recipe. 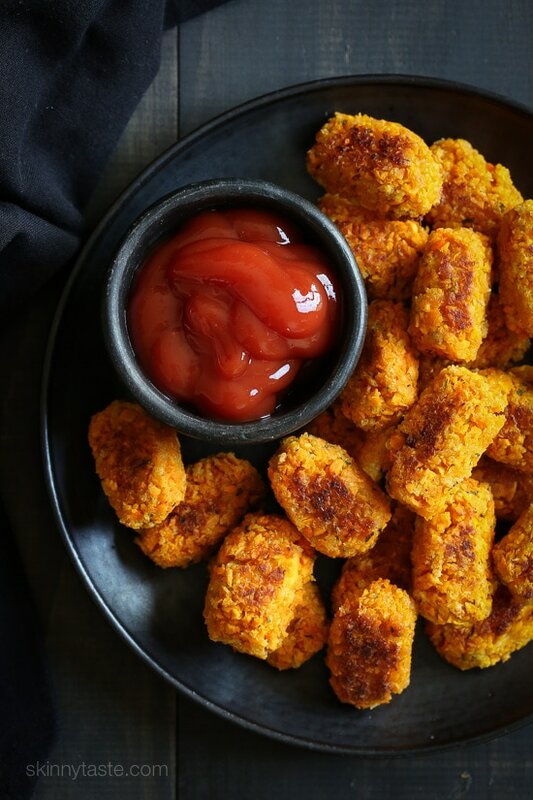 Gina – I’d like to make these sweet potato and carrot “tots” but my daughter is allergic to eggs unless baked for a certain time on a high temp of 450 degrees. If I omit the egg, what else could I substitute with, if anything? I made these last night, and added some diced onion, since I didn’t have onion powder. I also used regular breadcrumbs since that’s all I had. However, they completely crumbled after baking them. Did I do something wrong for them to not hold together when picking them up? I am having this same problem. This is my third try too! I made these over the weekend….the flavor was good, but I have no idea how you would get 30 of them! I used almost 1 lb of sweet potato (so almost double what it calls for). I made them very small, as noted, and still only got a yield of 24. I used parchment paper on my cookie sheet to prevent messes, and I had to cook them a little longer to get them browned even slightly. They never did really get crisp or brown…maybe because they were sharing the oven with my braising chicken . They are tasty, but you definitely need to adjust the amount you make if you want to serve six people with this recipe. Did you use level tablespoons? I also only got 26 out of the recipe … if I made them any smaller they wouldn’t hold together. Mine stuck a little bit on the first side, but no disasters. 🙂 they browned ok, but weren’t super crunchy. All-in-all, they were good, but i’m not sure i would go through the effort to make them again. I only managed to make 19 and they were very small! Looks really delicious! But I don’t really like cheese, what is the best alternative for cheese for this one? And thanks for sharing the mouthwatering recipe! You could leave it out. Made these tonight and they were delicious! Looks delicious – but 20 calories per to seems high to me! I’m gluten intolerant, do you think I could use almond flour as a binder? Yum! Do you think you could prepare these, then freeze and bake from frozen? I’m not always home to start dinner, but my husband would pop these in the oven. Can you give us any instructions on how to reheat them? Time? Temp? These sound wonderful, excited to try this recipe. Do you think it would be possible to freeze the formed tots and bake them when ready to use? I haven’t tried, it should be OK. Or you could bake, freeze and then reheat. Thank you so much for always giving the best recipes. I’ve always enjoyed every recipe I’ve tried from your site and both books. I’m on my way to the store to get some ingredients for Thanksgiving prep. Any chance you would ever post a time line for Thanksgiving food prep? It always seems like a challenge for me and I’d be interested to know how you work out all those little details. A great idea, I will try this year but if not next year for sure! My child has an egg allergy I always want to make something like this or broccoli bites but am not sure what to substitute does anyone have any ideas if you even can? You can substitute a “flax egg” in any recipe that requires an egg. Just a quick Google search you can find the way to substitute it! Good luck! I use a powdered egg replacer, you mix a small amount with water and when it bakes it imitates the binding properties of eggs. It’s vegan too! I get mine at Whole Foods. These sound great. I would love to make several batches and freeze them. Do you think you can freeze these? Would you freeze them raw or cooked? How would you reheat them? I haven’t tried freezing them so if you do let me know how they come out! Can’t wait to try with marinara or honey mustard. Making these tonight as a side dish for cod. I have the ingredients and they sound great! Green Giant actually sells a Riced Carrot and Sweet Potato blend in the frozen aisle, which could save some time if in a hurry! Definitely will try these soon. Thanks Gina! I haven’t tried but I think that would work! these sound amazing! I cant have that kind of cheese, do you think swiss would be ok as a substitute? Think im going to try these next week!